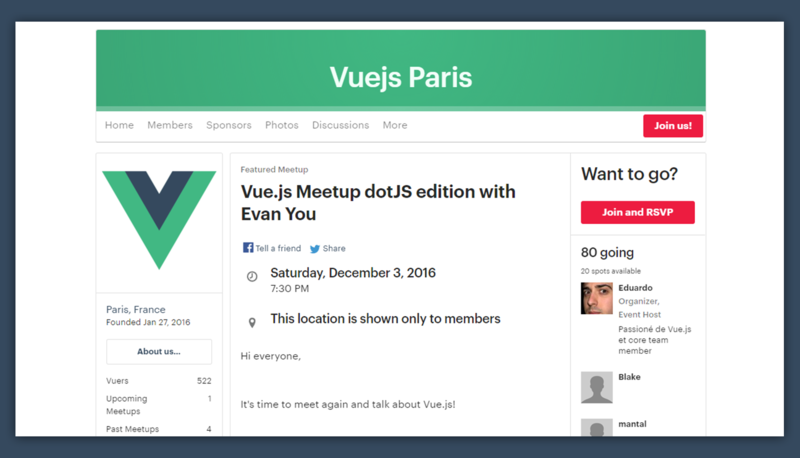 Vuejs Paris will have a special meetup on Dec 3rd, two days before dotJS conference. dotJS gathers a lot of people in Paris and among this people, Evan You, who is giving a talk at dotJS, has kindly accepted to give a talk about the rendering engine in Vue.js 2. But we have more, Sébastien Chopin, the creator of Nuxt.js, is also coming to dotJS and has volunteered to give us an introduction about Nuxt.js. You can find more information about the talks on meetup's page. You can go to the meetup around 7 pm and enjoy your cocktail, offered by TheFamily. Talks will start at 7:30 pm. Also, VuejsJobs is bringing some Vue stickers swag. Additionally, there will be a giveaway of some The Majesty of Vue.js 2 copies, offered by Alex Kyriakidis and Kostas Maniatis. So, if you are a Vue.js fun and it happens to be in Paris on December 3rd, you should definetely attend. See you there.